Our students are among the best in the UK and we are keen to work with you if you are interested in providing summer work placements, sponsoring student projects, or seeking to recruit graduates. Students on our four-year undergraduate degree programmes are encouraged to undertake work placements. Our students are highly skilled, enthusiastic, and capable of undertaking complex projects. If you would like to know more please contact Joyce Lewis (Tel: 023 8059 5453). Our students have one of the highest employability rankings in the UK and are much in demand by employers across high-tech industries, in the technology departments of companies in the finance and consultancy sectors and in the energy and transport sectors. We will be holding our annual Engineering and Technology Careers Fair on Tuesday 14 February 2017. The event takes place in the Garden Court, Highfield Campus, from 11 am to 3.30 pm and attracts over 1250 students. Over 90 companies attended the Fair in 2016 - if you are interested in having a stand at the 2017 event, please contact Joyce Lewis. You can find out more about our ECS employability initiatives on our Careers Hub. 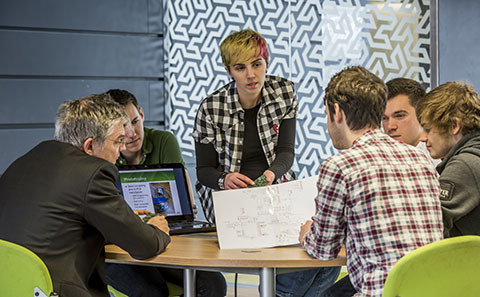 The Group Design Project is a major part of the final year of the MEng degree. It provides an introduction to intensive group project work in collaboration with an industrial or academic customer. At the end of the 10 week project, the students provide a group report of around 25,000 words, and then make a presentation on their project to demonstrate what has been achieved. Sponsors of this year’s projects include Xyratex, Detica, Tallix, Snowflake Software, and IBM. They benefit not only from the project deliverables, which typically include a working demonstrator, project report and regular progress reports, but also have an opportunity to improve their informal links with University academic staff and see how our final-year students perform. No direct financial contribution is required from the industrial customers, although if industrial sponsors wish a small budget to supplement that provided by the University can further assist the students. Some projects may also require help with the supply or loan of special equipment or components. Industrial customers are expected to attend three meetings: the project launch meeting in October, a progress presentations, and the final wrap-up meeting in January. To find out more about involvement in the Group Design Project, contact Dr Tracy Melvin. Nominations for projects are needed by 31 May for projects to be undertaken in the autumn. There are many other opportunities for working with our students; to find out more contact Joyce Lewis. The Engineering Doctorate programme (EngD) is funded by the Engineering and Physical Sciences Research Council (EPSRC) in collaboration with a sponsoring company. It enables a postgraduate student to spend half of their four-year programme undertaking research into real industrial problems for the sponsoring company, as well as undertaking taught courses during the first half of the course when students are based at the University. Students are supported by a tax-free stipend and they must be sponsored by a company with a R&D base in the UK.